I finally have a Tiny Delf! 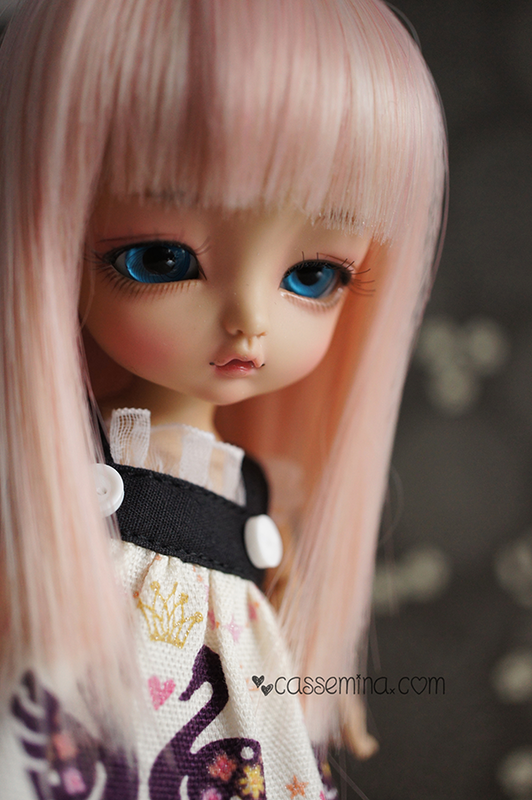 This has been a long time coming but my Tiny Delf Alice has finally arrived. She’s a gorgeous Real Brown Skin with the default Luts faceup and since she was purchased second hand so I don’t know if/how much she has yellowed over time. While I really love the sweet, subtle Luts makeup she does has a tiny chip in her eyeshadow which is slowly driving me insane – thankfully her wig is covering it up for now. These are the different shades of tan that I have in my collection – my favourite is still the Lati Yellow Light Tan which looks a little yellow in this picture but I think is a very realistic representation of a golden sun tan in real life. The Luts and AQ tans are also very nice although they tend towards the cooler browns than the golden Lati tan, I think I prefer the Luts tan slightly more than the AQ. The Pukifee/Fairyland Tan is a different story – I think while it photographs beautifully in real life it comes across slightly grey and mauve-ish and lacks the warmth of the other companies. It’s probably more of a natural skin colour than a colour achieved by a sun tan if that makes sense! You can also see here that Tiny Delfs are pretty much identical in size to a Lati Yellow however her head is a bit bigger – or at least her forehead area. This means that all my silicone wig caps don’t come close to fitting her – except the actual Luts ones (makes sense!). I also found her head cap very loose though it is held on by a magnet, it’s very easily removed even if most of the time that’s not on purpose. 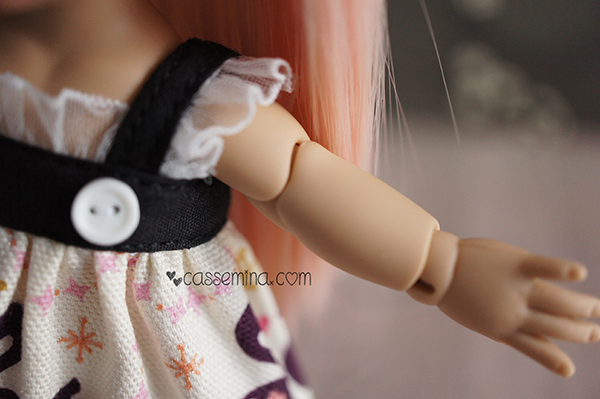 The general consensus in the BJD community is that the tiny delf body is great and has great posability – closer to that of a Pukifee than a Lati Yellow. She definitely stands very solidly and I have no worries of her falling over. In fact while trying to get the four dolls to line up in a row for the photo above I gained a new respect for the Tiny Delf and her ability to stand up! My Lati Yellow just did not want to stand – even with shoes on – her knees would buckle and she would topple over, this is surprising since my other Latis have been quite good so I’m chalking this one up to loose stringing? 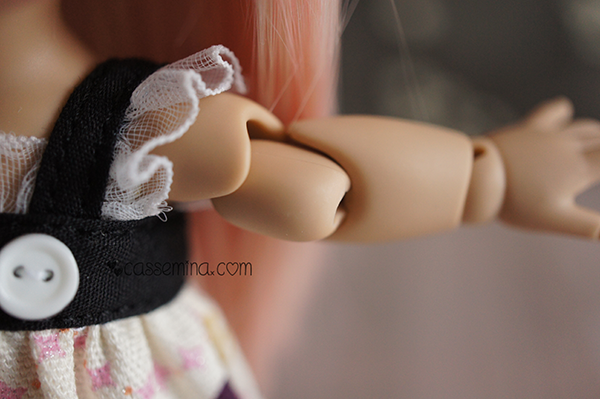 The one problem I have with Alice and probably Tiny Delfs in general are her arms. I hate them with a passion. 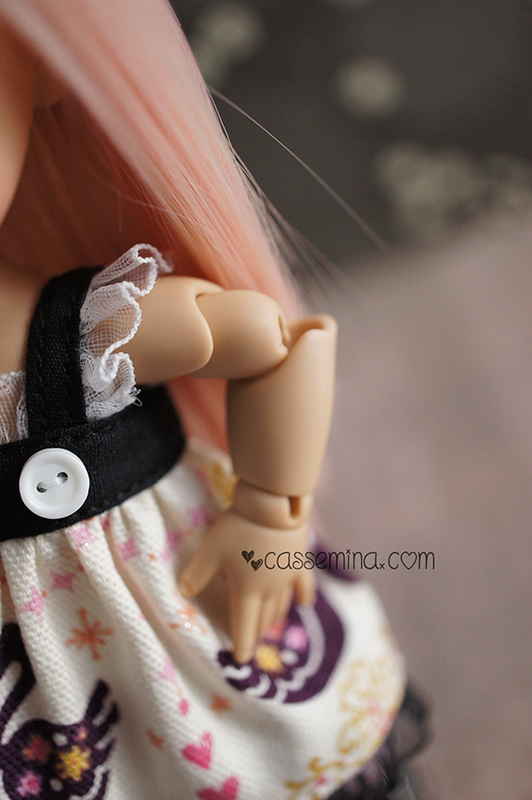 Keep in mind that my doll is second hand and might just be really loose but I find her arm/shoulder joints seriously problematic. They pop out of their joints way too easily and end up looking deformed most of the time. Opps joint popped out again! Now I don’t know if it’s just me but I am struggling to get these arms into any sort of natural position. I would love to hear from anyone who has a Tiny Delf who has worked out how to pose these little guys! My second problem is with her shoulders – I can’t get them down enough to have her arms by her side without it looking like I completely dislocated her shoulders, what am I doing wrong!? Now besides from the arms I find the Tiny Delf body to be at least as a good, if not better than a Lati Yellow (well definitely better in the standing department!). Besides the additional chest joint they are pretty similar from the waist down, Alice can sit nicely and her legs/hips can lock into a series of different positions easily. 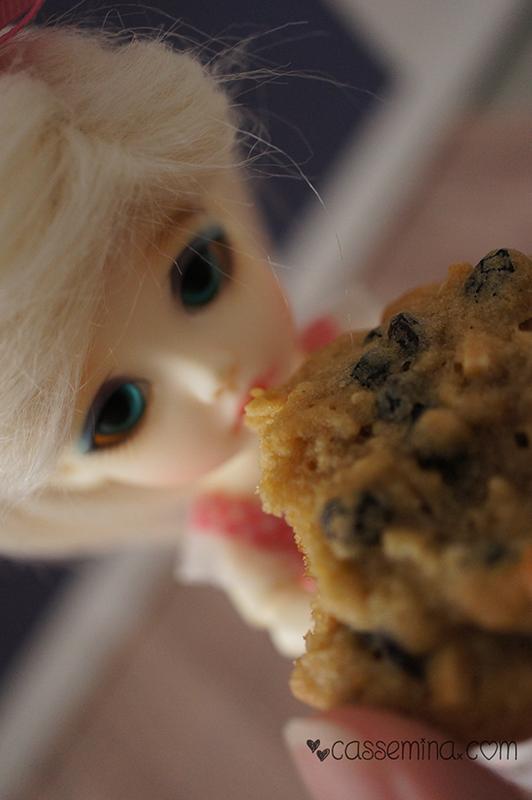 She also has really nice and chubby little hands! I think these are adorable and quite realistic. So while I think Alice is very cute and I’m happy to have a Luts doll in my collection, I don’t know if Tiny Delfs are my cup of tea – thankfully this means I won’t need to bring home anymore! I can’t work how whether to have my posts under cuts (i.e the ‘continue reading’ option) or to have everything on main page so you can just scroll without clicking into any individual posts! Please help me out and vote! P.S Please forgive me if I’m totally using the wrong blogging terminology! I don’t often post about my Pullips mostly because I’m pretty happy with my current collection and there haven’t been any changes/additions in a while. I did however order some kigurumis from Miss StarryHat which just arrived and they are so amazing I had to share with everyone! 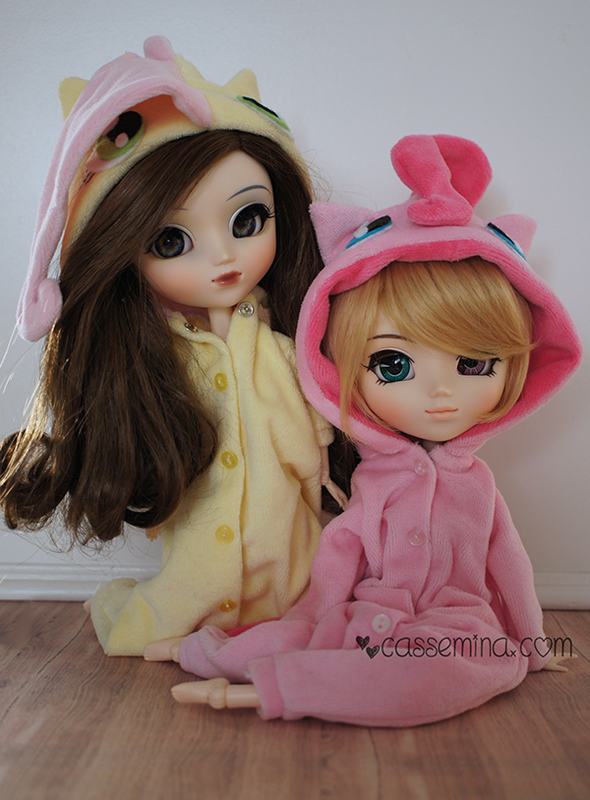 I admit to being a massive My Little Pony fan so of course the kigurumis I ordered were of Pinkie Pie and Fluttershy. 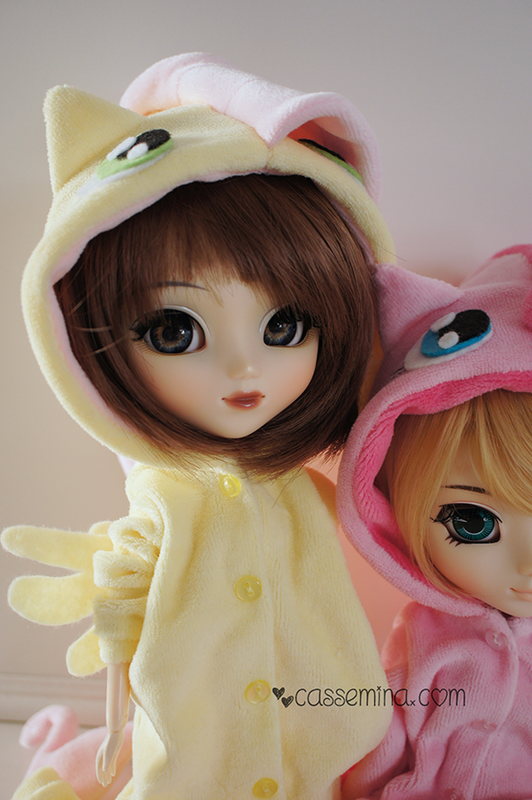 Sadly I didn’t get any photos of them by themselves as I got so excited I put them on my Pullips immediately. These little onesies are incredible! They are so well made and so detailed, they have tiny little snaps along the front for very easy removable- and of course they are incredibly adorable! What’s also great is they fit perfectly on both Type 3 Pullip bodies (and I assume therefore all the other standard Pullip bodies) and 27cm obitsu bodies. You can see how accurate they are – look at Fluttershy’s little wings! I also love how their sleeves can be scrunched up and they stay that way! This is the best photo I have of the two together although Cinci is wearing her old wig – it’s the stock Alte wig which is one of the best stock wigs in my opinion – she had a quick wig change halfway through the photoshoot as this was just too heavy and full for her hood. Apologises for the lack of posts lately! I have been sick and then completely unmotivated which is definitely not a great combination. I literally googled ‘upbeat happy girls name’ for PongPong. Totally creative hey! 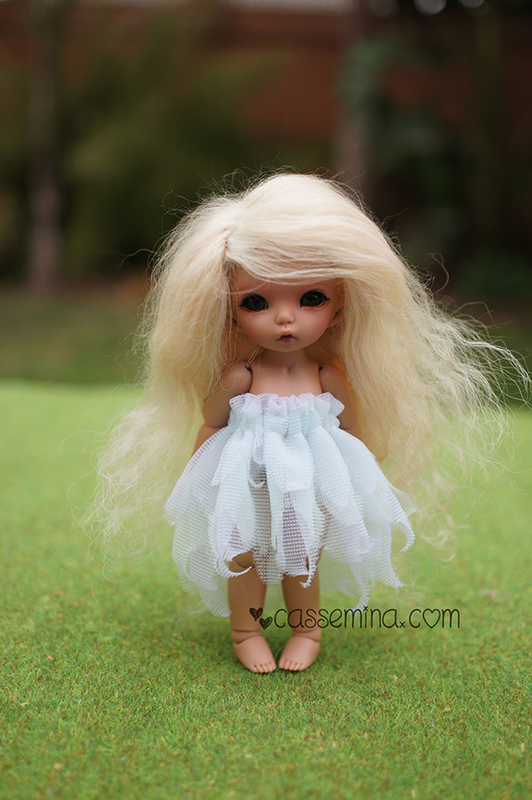 As you can see Bliss has had a few wig changes already – Puki wigs are difficult to find! 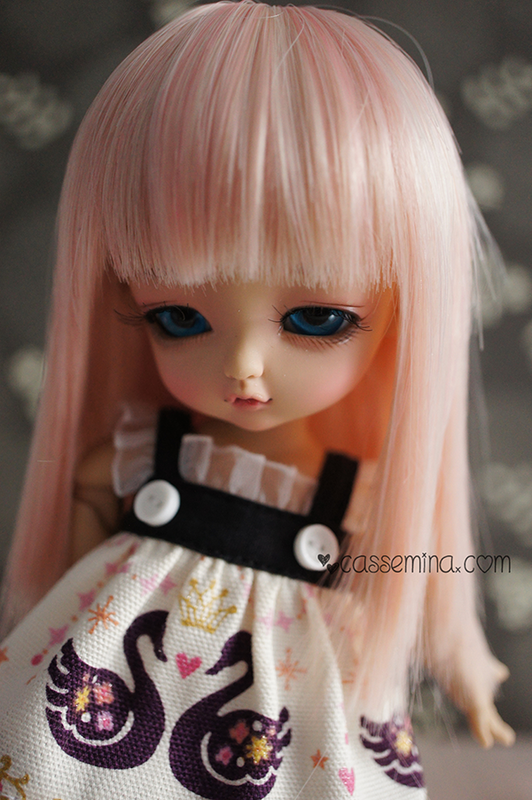 Besides the amazing mohair wigs that were handmade for me I also bought a few Puki wigs from DDE with my order. I purchased 2 x Fairyland Puki wigs (the brown one with a fringe in the photo above and the blonde pigtail bun in the first photo) and a size 3 leekeworld wig. All three cost a fortune for what they are and all three are terrible. The Leeke wig doesn’t come close to fitting even with a silicone wig cap, there is no elastic so the wig just ‘floats’ on the dolls head. The brown Fairyland one fits perfectly but is terrible quality, the fringe has a permanent bend in it about half way down just from sitting against the edge of the wig cap – I have tried to boil this out and I think it made it worse – the top of the wig is also not natural and rounded, instead it’s a little square again because the wig cap is just bad. The blonde Fairyland wig while ADORABLE is the biggest one yet, it doesn’t even come close to fitting – Bliss is currently hot glued to her wig. TERRIBLE. In other news Lucy got some new eyes! I really like Glib acrylics for all my Fairyland dolls – they are very very reasonably priced and I think they have amazing realistic pupil patterns. So my love affair with Pukis continues even though I have discovered they are not so easy to pose and balance when they don’t have a sheet of metal underneath them (or when the fake grass you use is too thick for the magnetism to work). There’s definitely more Puki purchases in the future since they are so tiny I can squeeze them into any corner of the dollhouse!